[I know Barrie Zwicker and respect him greatly. As a media critic, Zwicker’s credentials are impeccable: in addition to his commentaries on CBC Radio and Vision TV, he has worked for the Toronto Star and The Globe and Mail, and taught journalism at Ryerson University for seven years. Common Ground: According to a few polls taken in the US and Canada, there is a notable lack of faith in the official story on 9/11. Why do you think this disbelief persists, in spite of the lack of media interest in an alternative take on 9/11? Barrie Zwicker: The disbelief persists because despite the drumbeat of the official story, and despite the nearly utter failure of the mainstream media to raise questions about the absurdities and impossibilities of the official story, ordinary, decent people, using their own senses and adding two and two, smell something fishy. Especially because the people promoting the official story, namely the White House and the big media, also promoted the lie of WMDs in Iraq, and have lied and covered up on other large issues. What I call the apologist community has more and more to answer for. The early August Scripps Howard/Ohio University nationwide poll shows 36 percent of the US public “… suspects that federal officials assisted in the 9/11 terrorist attacks or took no action to stop them, so the United States could go to war in the Middle East.” The same poll shows “… anger against the federal government is at record levels.” The most common thing that Americans tell me is that the Bush regime is capable of anything and that it will stop at nothing. I agree. CG: You were skeptical early on about the official story on 9/11. What was it that gave you your initial doubts? BZ: My initial doubts arose before noon on the day of 9/11, based on the absence of any USAF response to the multiple hijackings, over a drama in the skies that lasted almost two hours. As a person always very interested in aviation, I knew that this quite simply was impossible. It turned out I was the first journalist in the world to go on national TV to question the official story. CG: If 9/11 were a conspiracy against the American people, it would presumably require the involvement of hundreds, if not thousands of people, to play their respective roles and maintain silence afterwards. What do you say to critics who say people can’t keep secrets, and that something this big is bound to get out? BZ: For one thing, I point to the Manhattan Project, in which the US developed and then exploded the first atomic bomb. Conceived in 1939, the Project, by its completion, involved 43,000 people at 37 facilities in 19 states and in Canada. It was kept entirely secret. Who knew about the stealth bomber until the military chose to reveal it? Who knew about the U-2 spy plane until one was shot down over the USSR, thereby wrecking the Paris peace talks? Large secrets can’t be kept? Gimme a break! CG: Many will be willing to go with you as far as the idea that the White House had forewarning of the attacks but allowed them to go through for political gain. But they will reject the idea of direct government involvement. What do you say to them? CG: In your book and DVD, you cite the declassified Operation Northwoods, a planned “false flag” operation that nearly came to be 30 years ago. Can you tell us more about this plan for a staged domestic terror attack? BZ: The frightening thing about Operation Northwoods was that the whole of the US Joint Chiefs of Staff unanimously signed off on it. It involved American citizens being killed, to make more real the lie that the Cubans were carrying out “terrorist attacks” against the US. Furthermore, most of the advisors around then PresidentJohn F. Kennedy were in favour of the horrible ruse, which would have led to the invasion of Cuba back in 1962. The rot of criminal, immoral, death-dealing deception was already that deeply rooted in the US White House then. Is today’s White House more pure? CG: In your book, you state that it is the cumulative weight of evidence, rather than any one incident that leads you to believe 9/11 was an inside job. If you were to name the closest thing to a smoking gun, what would that be? BZ: Smoking guns include the near freefall collapse – controlled demolition, for example – of WTC7. The non-appearance of the USAF for almost two hours on 9/11, and Bush saying he saw on ordinary TV the first plane hit, when footage of the hit was not aired on ordinary TV until the next day, come second and third in my lineup of smoking guns. CG: Can you tell us more about World Trade Centre building number seven? BZ: As mentioned, it was a matter of controlled demolition, which Larry Silverstein, the building’s owner, later admitted in the PBS documentary Rebuilding America. The question is could Osama bin Laden have been able to infiltrate his al Qaeda agents into WTC-7 weeks in advance and plant the required explosives? If he did have that power, how come the administration, and of course, the mass media in general, pay so little attention to this amazing power of Osama’s as to make WTC-7 a “non-building” to this day? 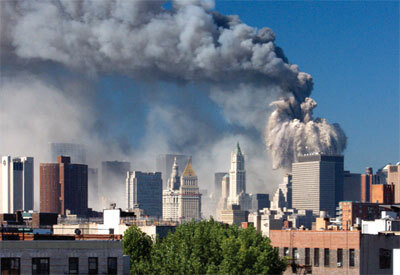 Why does the 9/11 commission’s report not mention its collapse whatsoever? CG: In your opinion, which techniques are being used to cover up the real story? BZ: They’re more than techniques. As I have written about extensively in my book, there are deep and widespread realities of the media that create a de facto censorship regime as powerful as Pravda and Izvestia ever were in the old Soviet Union. You have to start with the owners of the corporate media, who are closely supportive of the Bush White House. The Fox News network is, in effect, a privatized, propaganda network at the disposal of Bush and company. Add to this the traditions of journalism – he said, she said journalism, for instance – that treats lies and truth equally. And that journalists live in the same fiction-ridden society as everyone else, and are not, despite their pretensions, immune from “Big Picture BS.” As well, many, if not most, journalists are careerists and learn which stories or actions will get them raises and promotions, and which will get them into hot water. Put all these factors and many more, including peer group pressure, together and you get a situation akin to a school of fish; they all learn in which direction to swim and they all swim in that direction together. CG: Of the independent researchers and/or writers digging into this matter, whom do you follow and respect? BZ: There are many. And many, if not most of them, are ordinary, unsung people I meet in various cities who are doggedly pursuing 9/11 truth and trying to share it with their families, neighbours and colleagues. Of the better-known 9/11 truth activists, I think my greatest respect and admiration must go to Dr. David Ray Griffin, now the author of four books about the truth of 9/11. I devote a chapter to him in my new book. CG: Given your conclusions about 9/11, do you have suspicions about the attacks in Bali, Madrid and London? BZ: More than suspicions. In my book, I list 18 false flag operations, including Madrid and London. I also believe Bali 1 and Bali 2 were false flag ops. More recently, the trans-Atlantic exploding shampoo terror fraud was obvious from the beginning, as was the roundup of 17 “terrorist suspects” in Toronto in June of 2006. CG: In the past, mainstream media has shown its readiness to give nominal coverage to activists and their campaigns, only to dismiss them, or reduce the concerns to just one more scare story in a barrage of manufactured news. Are you concerned this could happen with your message? BZ: There are signs that, spurred by the inescapable imperative of news organizations to play up anniversaries in a big way, that even the mainstream is having to recognize there are a lot of people who are not on board with the official story. But after the fifth anniversary passes, there will be a tendency to once again relegate all 9/11 truth activity to the memory hole. Of course, other developments, especially one or more other horrendous false flag ops, could change the whole picture, probably much for the worse. CG: Many people would prefer to ignore or reject your conclusions. For to take any of it seriously means more than a co-opted or complicit media; it means we are governed by monsters and there is no social contract. What do you say to the people who reject your thesis, for fear of looking into the abyss? BZ: I sympathize with people who do not want, as you so well phrase it, to look into the abyss. It takes courage and a dedication to follow the truth wherever it may lead, however discomfiting or even threatening to the well- being of oneself and one’s family. At the same time, I think our best chance to get out of our multiple messes is to face them squarely, take the bull by the horns and join the struggle for a safer, saner world. In a way, I agree with Bush, and with Jesus, in their stating, “You’re either with me or against me.” One of the most dispiriting things is to encounter people who say, “I know what you say is true, but I don’t intend to do anything about it.” Would they say that if their doctor diagnosed them with cancer? CG: Do you see any chance in the near future of reversing a trend toward reduced civil rights, military expansion and global atmospheric breakdown? BZ: If by near future you mean five years, yes. I also think that if we the people have not seriously undermined the ruling hyper-militaristic, super-deceitful, power-mad oiligarchy of ruthless greedsters, they will have declared martial law and moved to full-fledged fascism. I do not say this lightly. I mean the kind of genocidal fascism that Hitler practised. Today’s oligarchy was spawned by the same forces – runaway corporatism and ideology – that fueled Hitler’s Third Reich. We either stop them, or we, and our children – those who survive – will be living in the Fourth Reich, which may be the ultimate fate of humankind, which is not wired for survival. As the resources run out, Earth will be a pathetic place, where a few ultra-wealthy live in fortified places, while the vast majority either die or barely survive. A successful revolution might be as unlikely as bringing the oil back. I think we have to imagine how good life on Earth could be if we smarten up and learn to live together, and how bad it could be if the present trends continue. Remember, the present trends, or at least most of them, are toward dystopia. To overlook this is to engage in fatal denial. Denial is probably the main Achilles’ heel of the species known as Homo sapiens. *The opinions expressed in this article are not necessarily or entirely those of From The Wilderness Publications.